Win a Steam key for thieving, turn-based strategy game Antihero! If you want to play Antihero you’re going to have to start thinking like a thief. But wait, don’t march off to try to steal the game from somewhere. There’s no need for that. We already have 20 copies of Antihero up for grabs. You don’t need to steal it but you will get it for free – that’s close enough to thievery, right? 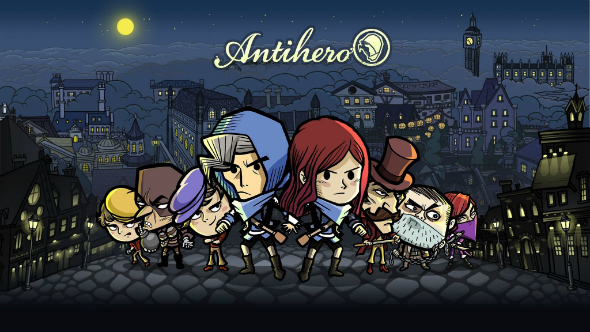 If you don’t know, Antihero is a fast-paced, turn-based strategy game set in a Victorian city. The idea of the game is to rob the city and be the most the successful thieves guild around. You’ll need to recruit thugs and street urchins, engage in bribery and blackmail, and if the other thieves get in the way then you’ll probably want to assassinate them. It can be played in single-player against the devious AI, but Antihero also supports multiplayer in both online and offline PvP, and in casual and ranked, too. Now, as said, we’re giving away 20 copies of the game, but it’s not just that. If you win, you’ll also get “The Book Club” Master Thief Character Pack, which adds four new Master Thief skins based on literary characters: Miss Alice, Ebeneezer Scrooge, Sherlock Holmes, and Tiny Tim. In order to enter the giveaway competition you need to check out the widget below. Every action you complete is worth one entry into the giveaway, and the more actions you complete the more chance you’ll have of winning. We’ll also need your email address so we can send you a code upon winning – we won’t send you spam, promise!